Dmitri Kudryashov received his MD from the Russian Medical State University (RGMU) in Moscow and PhD from the Russian Academy of Medical Sciences and Cardiology Research Center, where he studied the function of the Myosin Light Chain Kinase (MLCK) family of proteins. Dmitri continued his research on the actin and myosin cytoskeleton as a postdoctoral fellow at UCLA - in Prof. Emil Reisler’s group. For his postdoctoral work, Dr. Kudryashov received the Paul Boyer Award for Outstanding Postdoctoral Studies in Biochemistry and Herbert Newby McCoy Award. 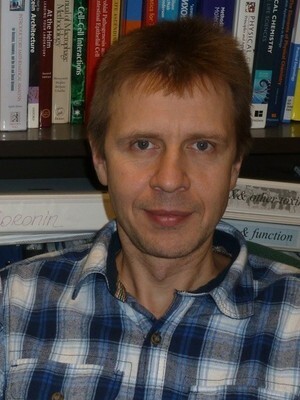 Dr. Kudryashov has joined the Department of Biochemistry at OSU and will commence his work there in April of 2011. 1. Actin – numerous functions of one protein. Actin is involved in the pathogenesis of infectious diseases as an element of the innate immune system, but also as a target that can be hijacked by many bacterial and viral toxins. We are interested in deciphering the role of actin in both phenomena. Thus, we investigate properties and the role of actin binding protein L-plastin in phagocytosis and migration of immune cells. There are three plastin isoforms in humans all of which seem to bind and bundle actin filaments in Ca2+-dependent manner. Interestingly, expression of L-plastin, but not the other two isoforms is frequently elevated in tumors and associated with their increased metastatic activity. We compare properties of L-plastin with two other human plastins (T- and I-plastins) in order to understand what makes the L-isoform particularly suitable for invasion. Next, we investigate the molecular and cellular mechanisms of the ACD (actin crosslinking domain) toxin from V.cholerae and several other Gram-negative bacteria. ACD covalently cross-links actin subunits into polymerization-defective oligomers and thus hampers the ability of immune cells to engulf and eliminate bacteria. Our data suggest that ACD is highly effective even at very low doses, when only a small population of actin in the affected cells is cross-linked. We propose that the cross-linked oligomers interfere with the activity of several vital cytoskeletal proteins (e.g. nucleators of actin polymerization formins) when present at very low concentrations leading to i) impaired ability of macrophages to fight bacterial cells and to ii) increased permeability of intestinal epithelial layers. Lately, the role of actin in numerous nuclear functions has been proposed, but progress in understanding of these roles at the cellular level is hampered by the lack of tools for selective targeting nuclear but not the cytoplasmic actin. Our lab is actively involved in development of such tools by utilizing actin-specific activities of bacterial toxins (ACD, SipA, etc.) and mammalian actin modifiers. Several bacterial toxins have attracted significant interest as potent antitumor agents due to their selectivity, ability to penetrate the cell membrane, high resistance against host defense systems, and demonstrated capacity to kill cells by mechanisms independent of the drug-resistant phenotypes of most tumors. Yet, the specificity of the currently recognized toxins towards tumor cells is limited due to a broad cross-specificity of the toxin receptors. We propose to deliver split variants of potent bacterial toxins via two different pathways uniquely represented only on the surface of cancer cells. The idea is that the fully functional toxin will be assembled only in the cytoplasm of a doubly targeted cancer cell. 3. Selective inactivation of bacterial toxins by human defensins. Defensins are a family of short cationic immune peptides with a broad repertoire of anti-microbial activities. Defensins disorganize bacterial cell membranes and inactivate protein bacterial toxins while showing little effect on host’s proteins. Yet, the amazing selectivity of defensins against various unrelated toxins is not well understood, nor has a coherent unifying hypothesis been proposed to explain this selectivity. In collaboration with Dr. Seveau from the Department of Microbiology at OSU we have developed a keen interest in deciphering the mechanisms of amazingly selective inactivation of bacterial toxins by human defensins. We propose that many bacterial toxins share an elusive common property that can be efficiently exploited by human defensins and we are currently in the process of identification of these elusive properties. The data acquired in the course of the project should lead to the development of rationally designed anti-toxin therapeutic agents. To accomplish our goals we employ highly interdisciplinary combination of biochemical, biophysical, and cell biology approaches, including but not limited to methods of fluorescence spectroscopy, circular dichroism, calorimetry, mass spectrometry, electron microscopy, cell imaging, and others. In addition, we collaborate with several groups for X-ray crystallography, NMR, and computational biology experiments. Because our lab is in the process of active growth and development, prospective graduate and undergraduate students are highly encouraged to join us. Your bright and open minds, innovative ideas, and skilled hands will find a welcome home in our group whether you are a graduate student in search for a project or an undergrad who is seeking to gain laboratory skills and contribute to solving important biological problems. 36. Serebryannyy LA, Parilla M, Annibale P, Cruz CM, Laster K, Gratton E, Kudryashov D, Kosak ST, Gottardi CJ, de Lanerolle P, ”Persistent nuclear actin filaments inhibit transcription by RNA polymerase II.” J Cell Sci. (2016) 129(18):3412-25. 35. Vilitkevich EL, Khapchaev AY, Kudryashov DS, Nikashin AV, Schavocky JP, Lukas TJ, Watterson DM, Shirinsky VP. Phosphorylation Regulates Interaction of 210-kDa Myosin Light Chain Kinase N-terminal Domain with Actin Cytoskeleton. (2015) Biochemistry (Mosc). 80(10):1288-97. 34. Kudryashova E, Lu W, Kudryashov DS “Defensins versus pathogens: an unfolding study.” (2015) Oncotarget 6(30):28533-4 - Invited Editorial. 33. Heisler DB, Kudryashova E, Grinevich DO, Suarez C, Winkelman JD, Birukov KG, Kotha SR, Parinandi NL, Vavylonis D, Kovar DR, Kudryashov DS “ACD toxin–produced actin oligomers poison formin-controlled actin polymerization.” (2015) Science 349(6247):535-9. Highlighted in Genetic Engineering & Biotechnology News (GEN), CHEMIE.DE, Bionity.com, Nature Reviews Microbiology, EurekAlert! AAAS, News Medical, Microbe World, Science Daily, Science Newsline Biology, Medical News Today, NewsUnited, NewsWise, sott.net, phys.org. 32. Kudryashova E, Seveau S, Lu W, Kudryashov DS "Retrocyclins neutralize bacterial toxins by potentiating their unfolding." (2015) Biochemical Journal 367(2): 311-320. 31. Wang N, Wang M, Zhu YH, Grosel, TW, Sun D, Kudryashov DS, Wu JQ “The Rho-GEF Gef3 interacts with the septin complex and activates the GTPase Rho4 during fission yeast cytokinesis.” (2015) Molecular Biology of the Cell 26(2): 238-255. 30. Ge P, Oztug Durer ZA, Kudryashov DS, Zhou HZ, Reisler E “CryoEM reveals different coronin binding modes for ADP- and ADP-BeFx- actin filaments.” (2014) Nature Structural & Molecular Biology 21(12): 1075-1081. F1000Prime recommended. 29. Kudryashova E, Quintyn RS, Lu W, Seveau S, Wysocki V, Kudryashov DS “Human defensins facilitate local unfolding of thermodynamically unstable regions of bacterial protein toxins.” (2014) Immunity 41(5): 709-721. Highlighted in Immunity, NSF Science360 News, Nature Immunology. F1000Prime recommended. 28. Kudryashova E, Heisler D, Zywiec A, Kudryashov DS "Thermodynamic properties of the effector domains of MARTX toxins suggest their unfolding for translocation across the host membrane." (2014) Molecular Microbiology 92(5): 1056-1071. 27. Lyon AN, Pineda RH, Kudryashova E, Kudryashov DS, Beattie CE “Calcium binding is essential for plastin-3 function in Smn-deficient motor neurons.” (2014) Human Molecular Genetics 23(8): 1990-2004. 26. Kudryashov DS, Reisler E “ATP and ADP actin states.” (2013) Biopolymers 99(4): 245–256. 25. Durer ZA, Kudryashov DS, Sawaya MR, Altenbach C, Hubbell W, Reisler E "Structural States and Dynamics of the D-Loop in Actin." (2012) Biophysical Journal 103(5): 930-939. 24. Kudryashova E, Kalda C, Kudryashov DS "Glutamyl Phosphate Is an Activated Intermediate in Actin Crosslinking by Actin Crosslinking Domain (ACD) Toxin." (2012) PLoS One 7(9): e45721. 23. Galkin VE, Orlova A, Kudryashov DS, Solodukhin A, Reisler E Schröder GF, Egelman EH "Remodeling of actin filaments by ADF/cofilin proteins." (2011) Proceedings of the National Academy of Sciences USA 108(51): 20568-20572. 22. Kudryashov DS, Grintsevich EE, Rubenstein PA, Reisler E "A Nucleotide State-sensing Region on Actin." (2010) Journal of Biological Chemistry 285(33): 25591-25601. 21. Grintsevich EE, Galkin VE, Orlova A, Ytterberg AJ, Mikati MM, Kudryashov DS, Loo JA, Egelman EH, Reisler E "Mapping of Drebrin Binding Site on F-Actin." (2010) Journal of Molecular Biology 398(4): 542-554. 20. Oztug Durer ZA, Diraviyam K, Sept D, Kudryashov DS, Reisler E "F-Actin Structure Destabilization and DNase I Binding Loop Fluctuations Mutational Cross-Linking and Electron Microscopy Analysis of Loop States and Effects on F-Actin." (2010) Journal of Molecular Biology 395(3): 544-557. 19. Kudryashov DS, Durer ZA, Ytterberg AJ, Sawaya MR, Pashkov I, Yeates TO, Ogorzalek Loo R, Loo J, Satchell KJ, Reisler E “Connecting actin monomers by iso-peptide bond is a toxicity mechanism of the Vibrio cholerae MARTX toxin.” (2008) Proceedings of the National Academy of Sciences USA 105(47): 18537-42. 18. Sawaya* MR, Kudryashov* DS, Pashkov* I, Reisler E, Yeates TO “Multiple crystal structures of actin dimers and their implications for interactions in the actin filament.” (2008) Acta Crystallographica Section D, Biological crystallography 64: 454-65. * Co-first authors. 17. Kudryashov* DS, Cordero* CL, Reisler E, Satchell KJ "Characterization of the enzymatic activity of the actin cross-linking domain from the Vibrio cholerae MARTX(Vc) toxin." (2008) Journal of Biological Chemistry 283(1): 445-452. * Co-first authors. 16. Cordero* CL, Kudryashov* DS, Reisler E, Satchell KJ "The actin cross-linking domain of the Vibrio cholerae RTX toxin directly catalyzes the covalent cross-linking of actin." (2006) Journal of Biological Chemistry 281(43): 32366-32374. * Co-first authors. 15. Kudryashov# DS, Galkin VE, Orlova A, Phan M, Egelman EH, Reisler E “Cofilin cross-bridges adjacent actin protomers and replaces part of the longitudinal F-actin interface.” (2006) Journal of Molecular Biology 358(3): 785-97. # Corresponding author. 14. Kudryashova E, Kudryashov D, Kramerova I, Spencer MJ "Trim32 is a ubiquitin ligase mutated in limb girdle muscular dystrophy type 2H that binds to skeletal muscle myosin and ubiquitinates actin." (2005) Journal of Molecular Biology 354(2): 413-424. 13. Kudryashov DS, Sawaya MR, Adisetiyo H, Norcross T, Hegyi G, Reisler E, Yeates TO “The crystal structure of a cross-linked actin dimer suggests a detailed molecular interface in F-actin.” (2005) Proceedings of the National Academy of Sciences USA 102(37): 13105-13110. 12. Orlova A, Shvetsov A, Galkin VE, Kudryashov DS, Rubenstein PA, Egelman EH, Reisler E "Actin-destabilizing factors disrupt filaments by means of a time reversal of polymerization." (2004) Proceedings of the National Academy of Sciences USA 101(51): 17664-17668. 11. Muhlrad A, Kudryashov D, Michael Peyser Y, Bobkov AA, Almo SC, Reisler E "Cofilin induced conformational changes in F-actin expose subdomain 2 to proteolysis." (2004) Journal of Molecular Biology 342(5): 1559-1567. 10. Kudryashov DS, Stepanova OV, Vilitkevich EL, Nikonenko TA, Nadezhdina ES, Shanina NA, Lukas TJ, Van Eldik LJ, Watterson DM, Shirinsky VP. "Myosin light chain kinase (210 kDa) is a potential cytoskeleton integrator through its unique N-terminal domain." (2004) Experimental Cell Research 298(2): 407-417. 9. Kudryashov DS, Phillips M, Reisler E "Formation and destabilization of actin filaments with tetramethylrhodamine-modified actin." (2004) Biophysical Journal 87(2): 1136-1145. Editor’s Choice Article. 8. Vilitkevich EL, Kudriashev DS, Stepanova OV, Shirinsky VP "A new actinbinding area of the myosin light chains’ high-molecular kinase." (2004) Ross Fiziol Zh Im I.M. Sechenova (Russian journal of physiology, Rus) 90(5): 577-585. 7. Kudryashov DS, Reisler E "Solution properties of tetramethylrhodamine-modified G-actin." (2003) Biophysical Journal 85(4): 2466-2475. 6. Kudryashov DS, Vorotnikov AV, Dudnakova TV, Stepanova OV, Lukas TJ, Sellers JR, Watterson DM, Shirinsky VP "Smooth muscle myosin filament assembly under control of a kinase-related protein (KRP) and caldesmon." (2002) Journal of Muscle Research and Cell Motility 23(4): 341-351. 5. Krymsky MA, Kudryashov DS, Shirinsky VP, Lukas TJ, Watterson DM, Vorotnikov AV "Phosphorylation of kinase-related protein (telokin) in tonic and phasic smooth muscles." (2001) Journal of Muscle Research and Cell Motility 22(5):425-437. 4. Chibalina MV, Kudriashov DS, Shekhonin BV, Shirinskiĭ VP "Functional properties and intracellular localization of high molecular weight isoform of myosin light chain kinase." (2000) Tsitologia (Cytology, Rus) 42(3): 248-255. 3. Vorotnikov AV, Krymsky MA, Chibalina MV, Kudriashov DS, Shirinsky VP "Differences in contraction and regulatory protein phosphorylation of phasic and tonic smooth muscles." (2000) Tsitologia (Cytology, Rus) 42(4): 378-391. 2. Kudryashov DS, Chibalina MV, Birukov KG, Lukas TJ, Sellers JR, Van Eldik LJ, Watterson DM, Shirinsky VP "Unique sequence of a high molecular weight myosin light chain kinase is involved in interaction with actin cytoskeleton." (1999) FEBS Letters 463(1-2): 67-71. 1. Bushueva TL, Teplova MV, Bushuev VN, Kudriashov DS, Vorotnikov AV, Shirinskiĭ VP "Stability of the structure of KRP (kinase-related protein)." (1999) Molecular Biology (Rus) 33(2): 227-236.